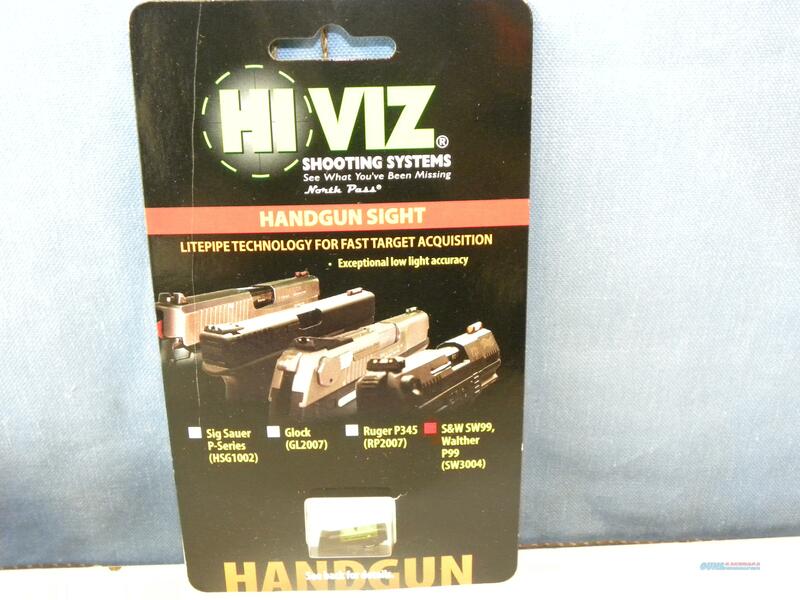 Description: HIVIZ Green fiber optic front sight for a S&W 99. Please take a look at our other listings or visit our website at fmzguns.com for more inventory! If there is any firearm or accessory you are looking for let us know and we will try our best to find it for you. We accept payment for firearms and accessories with U.S. postal money order, Visa, Master Card and Discover The price listed is the cash price. Please add 3% for credit card purchases. Used firearms sales are AS IS. If payments are not received within 10 business days, the item will be relisted and the transaction will be considered cancelled. Please check your state and local laws and regulations before purchasing. Please refer to the item description and the item pictures PRIOR to purchasing. If you have any questions that go beyond the photos or description please send us a message with specific questions BEFORE submitting an offer to buy. We allow a three day NON-FIRE visual inspection for all firearms. The firearm cannot leave the FFL. If the item is returned the buyer must pay shipping costs. The value of the firearm will be returned once is has arrived at our store location minus a 10% restocking fee. The purchaser and whoever the purchaser allows to use pre-owned, used, vintage, curio and relic or antique firearms/weapons assumes all liability for minor injury, serious injury, or death from use of firearms/weapons, regardless of what end of the barrel you or others are viewing. The purchaser MUST have a competent, licensed gunsmith evaluate the firearm for safety prior to firing live ammunition. We are a family-owned business, located in Miami Florida. Our Family shares a great love and respect for firearms and for the Legal use of them. We support the NRA and the 2nd amendment of the United States Constitution. We have both a brick and mortar store and a web site store. You can get the best from both worlds. Wonderful , knowledgeable service, prompt shipment and great prices both in our store and online!!! Contact us with any questions or comments, we are happy to help you.